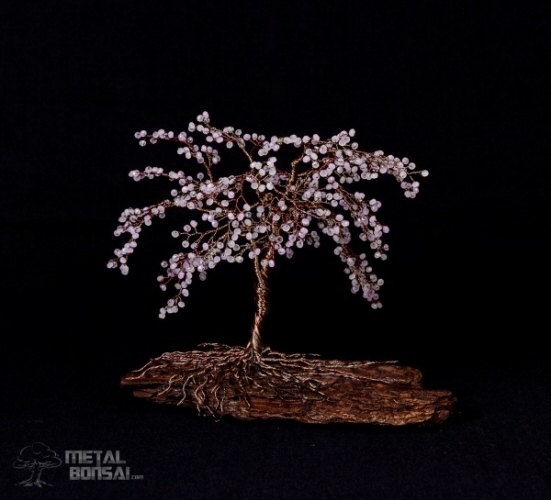 This sakura or cherry blossom crystal tree sculpture is made up of over 300 pink and white glass faceted beads. The wires are two types of brown which are wound together with a nice open root system at the base. The tree sculpture is mounted an sealed bark base to balance the tree. This sculpture has a very strong feel of late spring and Hanami (花見?, “flower viewing”), the season when cherry blossoms trees are in flower all over Japan and shed their petals. The viewing of the petals falling is a reminder of the fragility of life and it’s impermanence.